KEEP YOURSELF AND YOUR PASSENGERS SAFE WITH REAL SEAT BELTS! Choose from a gorgeous brushed aluminum GM logo button or generic Starburst logo button. 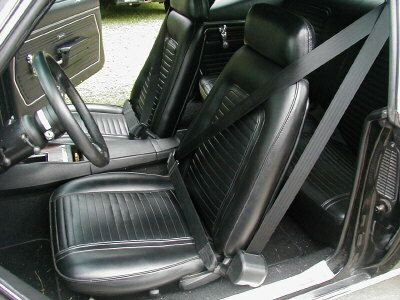 Each pair of front 3-point seat belts will bolt into all existing factory holes in your 1967-69 or 1970-73 Camaro. The brackets that bolt into the floor are made out of stainless steel and are e-coated black. The belts are sewn according to the vehicle manufacturer's pattern to increase their strength, and come in all of the colors shown in the color grid picture. The bracket in the main picture is for a specific car and year, and is used to represent all GM front 3-point seat belts on our site. The brackets you receive may look slightly different to fit the floorpan of your specific car and year.